The longest serving Lifeboat at Longhope to date with the most lives saved. She was a twin-engined, Watson class, Length: 45’ 6" Beam: 12’ 6" Draft: 4’ 6" Speed: 9 knots , non-self-righting lifeboat. Built by Groves & Guttridge of Cowes at a cost of £7,120 in 1933. 1936 Bronze medal awarded to Coxswain William Dass for the rescue of 41 men from the French trawler 'Neptunia' of Le Havre ashore at Brims Ness on 21 February. It was a service skilfully and courageously carried out in conditions made more difficult by the intense darkness. The searchlight was in use the whole time. The Institution's Thanks on Vellum was awarded to Mr William Sutherland who retired after serving since 1922 as the honorary secretary at Longhope. During those 24 years the Longhope Lifeboat had rescued 272 lives. In 1932 Mr Sutherland was awarded the Institution's inscribed binoculars and in the same year he won an inscribed barometer for his energy and initiative in directing a very difficult and dangerous service when the lifeboat rescued the crew of the Hull trawler 'Dorbie'. Mr Sutherland was succeeded as honorary secretary by his daughter, Miss M Sutherland. 1951 Bronze medal awarded to Coxswain Alfred Johnston for the rescue of the crew of 40 of the Swedish mv 'Oljaren' on 12/13 April in a service lasting 23 hours. 1959 Silver medal awarded to Coxswain Daniel Kirkpatrick for the rescue of the crew of 14 of the trawler 'Strathcoe' ashore on 4th February, by breeches buoy. During this rescue the cook was recovered upside down, the breeches buoy having tipped due to breaking seas. 1960 Thanks on the Institution inscribed on vellum accorded to Coxswain Daniel Kirkpatrick for putting out in the lifeboat to the assistance of the Aberdeen trawler 'George Robb' on 7 December 1959 ashore on Duncansby Head. The trawler was lost with all hands and although the lifeboat did not save life or render any assistance the conditions prevailing imposed a considerable degree of hardship on the coxswain and crew due to the extremely severe weather. A whole gale (force 10) gusting to storm (force 11) was blowing from the south east and the weather was overcast with squally conditions and poor visibility. There was a steep confused sea in the Pentland Firth and the lifeboat took a terrible pounding. Throughout the passage across the Pentland Firth it took three men to hold the wheel and maintain course. Returning to calmer waters crewman Robbie Johnston discovered that his secure hold on the mast was now to only a short stump, conditions were such that the mast had snapped. On hauling the lifeboat into the station it was discovered that the starboard bilge keil was missing and due to pounding the putty had been knocked out of the nail heads on the starboard side forad. 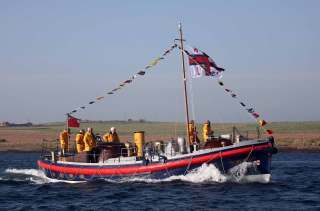 The lifeboat had to be temporarily withdrawn from service for repairs. Coxswain Daniel Kirkpatrick received a gift from the James Michael Bower Endowment fund. This fund was established in 1955 by the Peninsular and Oriental Steam Navigation Company as a memorial to James Michael Bower, late third officer of the ss 'Stratheden' who lost his life in a disaster. Awards from the funds are made to those who receive either a Gold or Silver medal of the RNLI for gallantry. 2000 Ex Longhope Lifeboat Thomas McCunn (Pentland Speir) bought from Mr Peter Roberts of Midhurst, Sussex for the sum of £1 Scots on the 29th July. She was sailed home from Hayling Island by a crew of current and ex-lifeboat men and visited 8 East coast lifeboat stations on passage.She arrived back home in Longhope on the 7th August. 15 minutes early on her ETA which was set at the beginning of this voyage.